What September recipes is everyone bringing out? Or is it almost time for autumn recipes!! I’ve been pickling, storing and making lots of different things recently 🙂 I will update you with all of them, I promise!! It continues to be lovely and sunny here in the UK (for the most of it) so I’ve been making nice light, summery bentos. 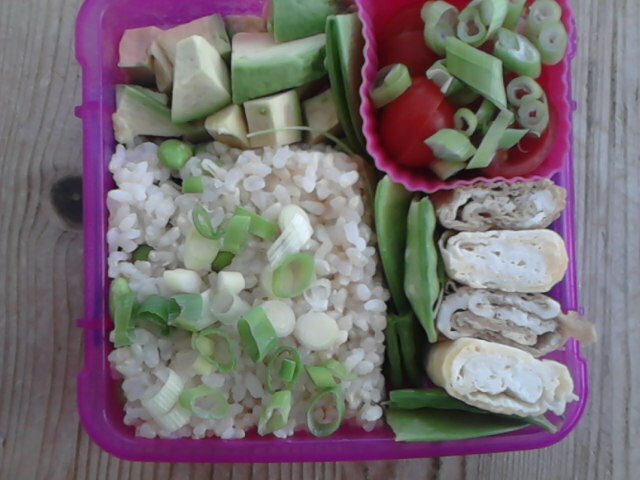 In this bento (above) is brown sushi rice (with sushi vinegar), with spring onions on top; diced avocado, cherry tomatoes and more spring onions; mange-tout and two types of tamagoyaki. The darker one has more soy sauce in the mix, and the lighter one is made with more mirin, so it’s a little sweeter. I hope everyone has been enjoying whatever weather they have had! 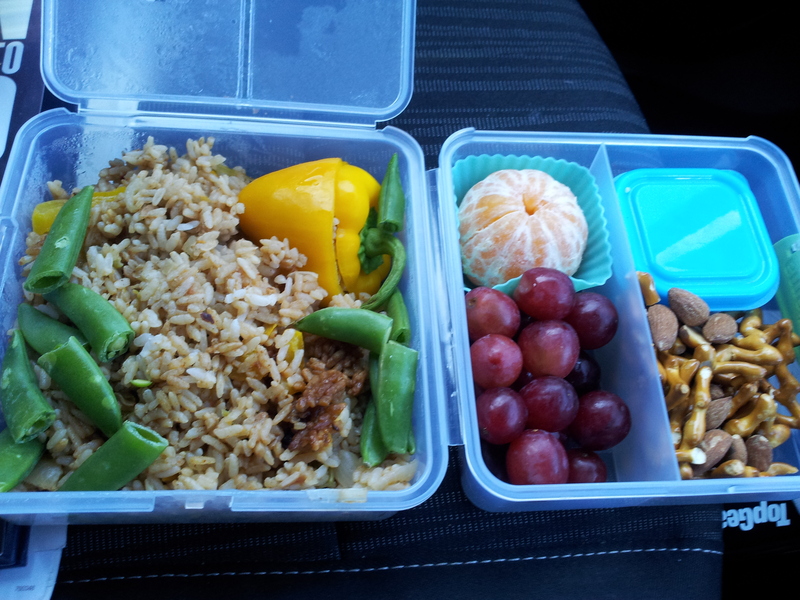 How is the bento/healthy lunch making going over the holidays? 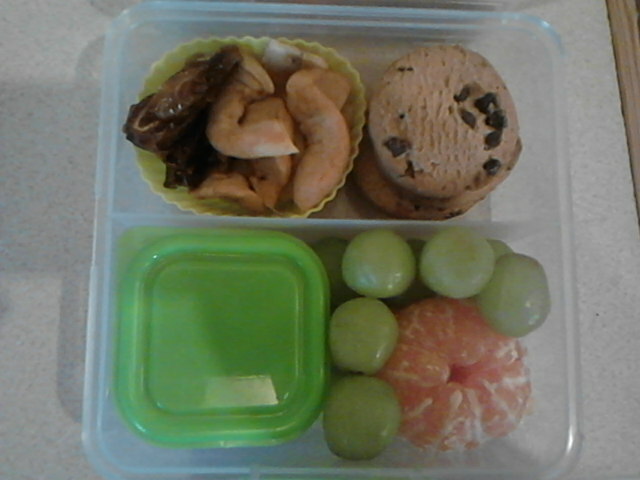 The main in my bento today was amazing! I said yesterday that I was going to make myself some sushi rice for today, and make it I did! I mixed it with rice vinegar, a little salt and sugar and sprinkled it with store bought furikake. 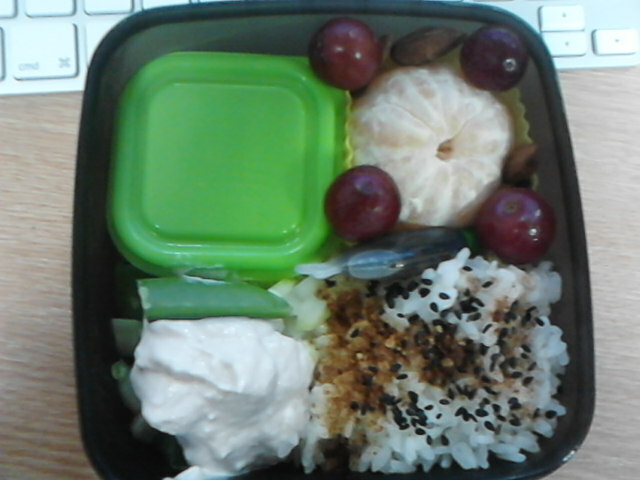 The rest of the bento is filled with leftover roasted vegetables (in a cool stripe pattern!). The leftover vegetables were sweet potato, green peppers (capsicum for you guys and girls across the pond), yellow and red peppers and courgette (zucchini).Yummy! 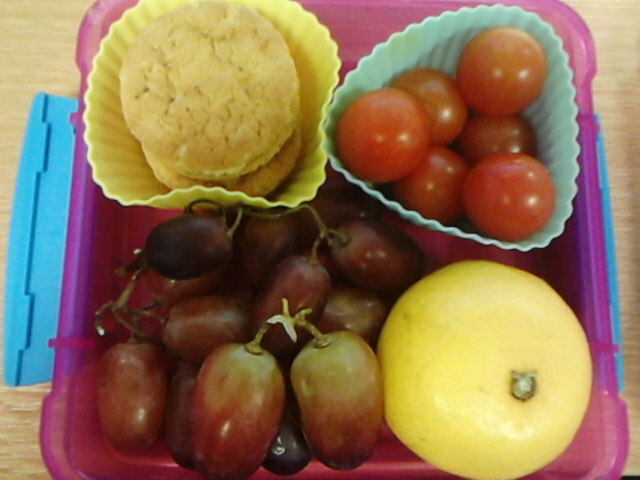 For snacks I had cherry tomatoes, a satsuma, grapes and a couple of Fox’s Crunch Creams (so good!!). I snacked on these throughout the afternoon. Oooh, have you noticed?? This bento is in a new bento box!!! I got it the other week but have been trying out different ways of packing it before showing it off to you guys and girls. 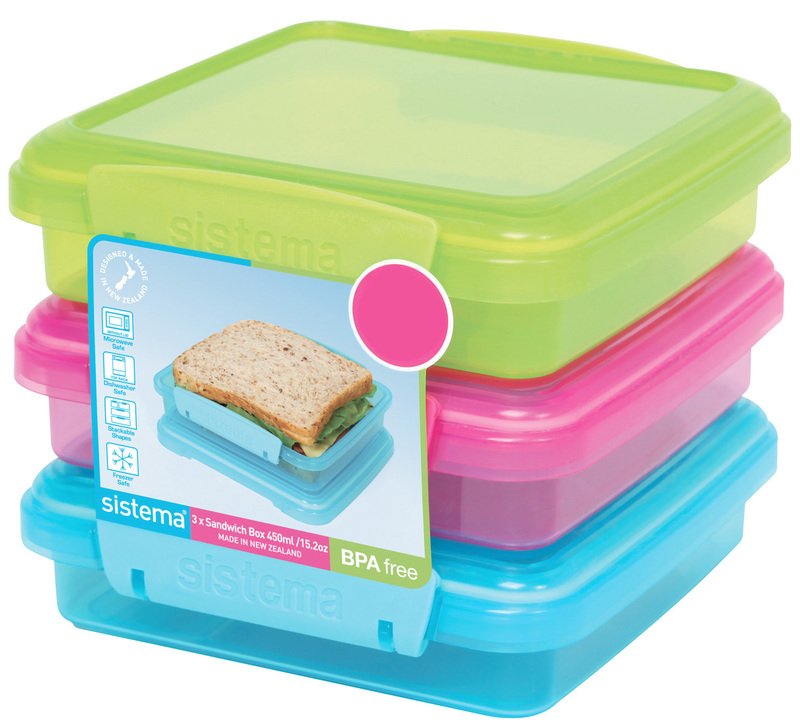 I bought a 2 pack of the Sistema sandwich boxes when they were on offer for £2.50 at my local supermarket (below is a picture of a paxk of three in slightly different colours). The colours that I got were purple with orange clips and pink with blue clips 🙂 They are quite small but perfect for the size of lunch I eat. I will look into doing a bigger review for these soon. And, as todays Friday, here’s an awful bonus picture. As I had made sushi rice the night before, I fancied having a japanese breakfast this morning! 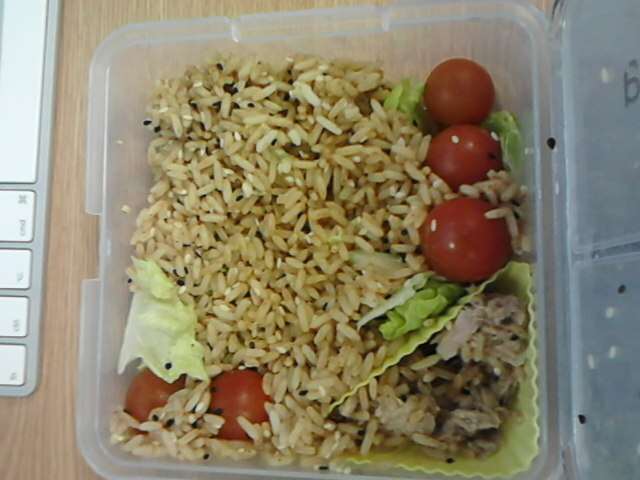 I had sushi rice, sprinkled with furikake, sushi ginger, vegetables, mackerel in tomato sauce, nori, and soy sauce. It was so yummy!! What is your favourite style of breakfast? Western, Asian or Continental? On the side though, we have a small pot of nuts and seeds, satsuma, grapes, choccy chip cookies and a mix of dried fruit (apple rings, dates and banana chips). And for the main, 14 rolls of cucumber maki (this was for the bf! 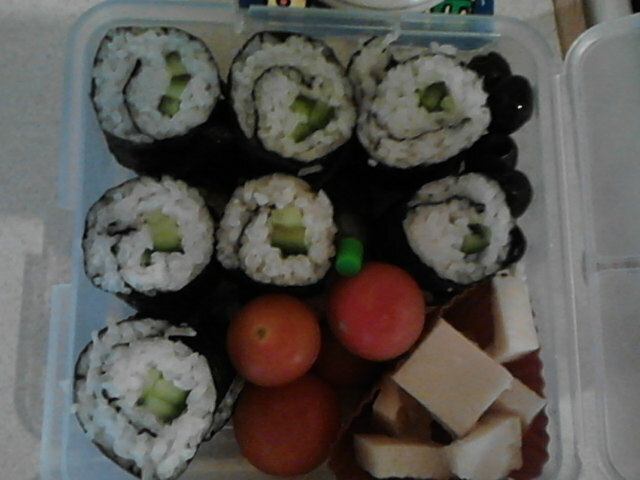 ), cherry tomatoes, black olives and cubes of cheese. There is also a fish of soy sauce in there too. Who else is following the JustBento course at the moment? If anyone is looking to go into bento making, head over there for all the tips you’ll need! 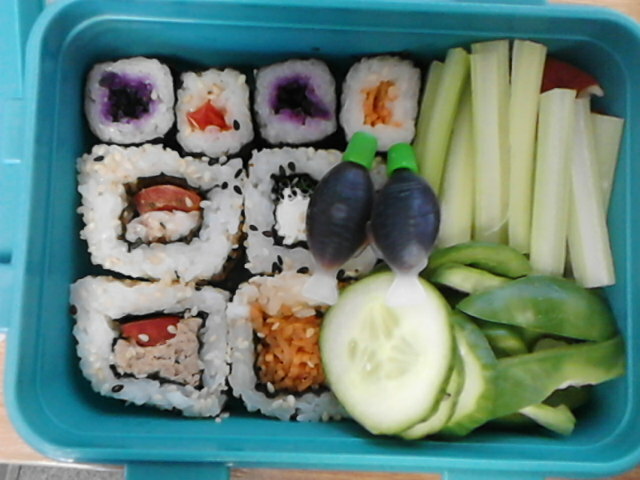 Very varied and colourful Bento today. This one is for the bf in a Sistema Lunch Cube. 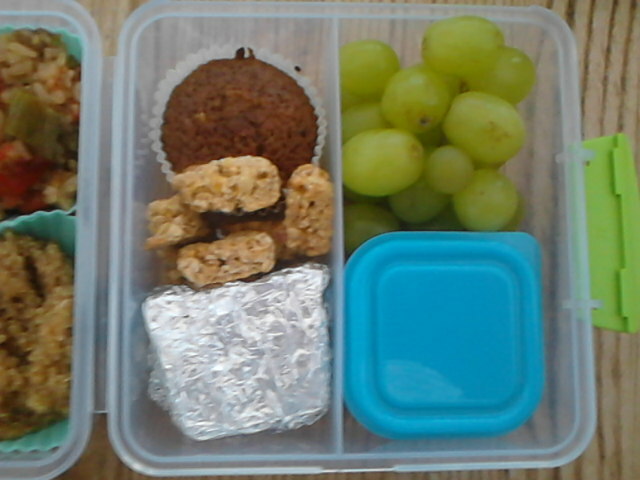 In the snack section, he has malt loaf (in silver foil), nutty cereal bites, hot chocolate cupcake (no icing), grapes and a small pot of mixed nuts and raisins. 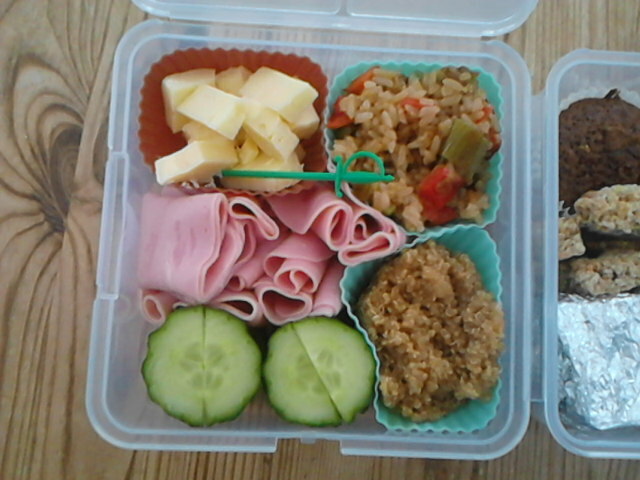 In the main half of the Lunch Cube, there is a silicon cupcake case of miso quinoa (so yummy-just cook the quinoa in miso soup), a cupcake case full of leftover firecracker rice, cheese cubes (with a pirate sword pick), ham rolls, and sliced cucumber. Looking at that lunch is making me hungry again! Do you sometimes look in the fridge and end up having so many different parts to your lunch/dinner? As promised, here is the recipe for Firecracker Rice from the Yo Sushi Cookbook. It is so good! Heat a large wok or non-stick frying pan over a medium heat and add 2 tablespoons of vegetable oil. Allow the oil to heat up before adding the chopped onion. Stir-fry for two to three minutes, then add the carrot, red and yellow peppers, garlic and edamame (or peas if you have substituted them). Cook for three minutes, then remove the vegetables with a slotted spoon and set aside. Add the remaining vegetable oil, if required, together with the sesame oil. Add the rice, separating the grains with a wooden spatula so that there are no large lumps, and stir-fry for two to three minutes. Return the vegetables to the pan, tossing and stirring to mix them thoroughly with the rice. Pour the soy sauce along the edge of the wok or pan, season with the white pepper and shichimi togarashi and stir to mix well. 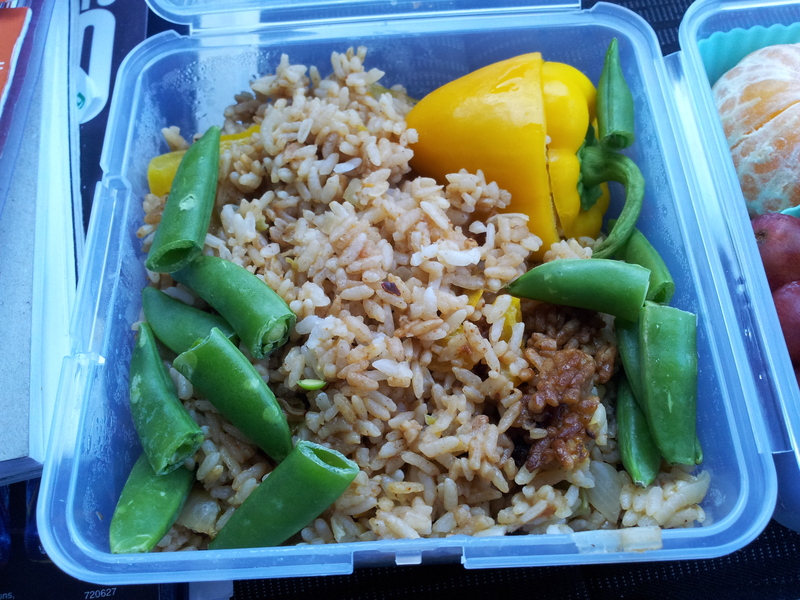 Remove from the heat, divide the rice into four equal portions, garnish with the chopped spring onion and serve. It’s best to use light soy sauce so as not to discolour the vegetables and rice. If you only have the dark variety, you may need to add a pinch of salt. Edamame are actually green soya beans and are available from Birdseye. They can be found in most leading supermarkets. 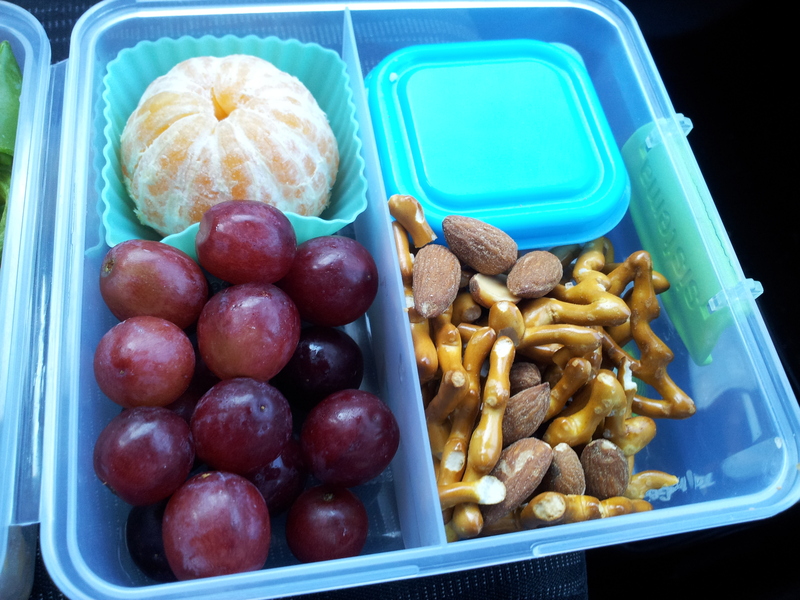 I feel so much better for packing this size lunch today! 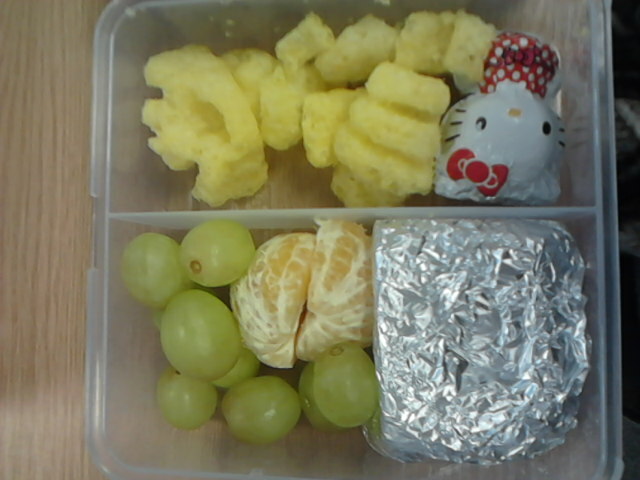 I said yesterday that I feel bloated the day after a fast, so I took the steps to prevent that today and had a smaller lunch 😀 It was packed in my Hello Kitty lunchbox, which is almost half the size of the Sistema Lunch Cube. Today for lunch, I had sushi rice, sprinkled with Japanese 7 spice, black sesame seeds and there is a small smear of wasabi on it too (soy sauce fish is next to the rice). I also had diced pan choi and sugar snap peas with taramasalata on top (bottom left), satsuma and grapes, with a few almonds tucked down the side. In the little green lidded box I had placed some treats for after lunch, which included a few pink smarties and a small sweetie bracelet. Currently I do not feel bloated, even though I’ve had a couple of biscuits too! 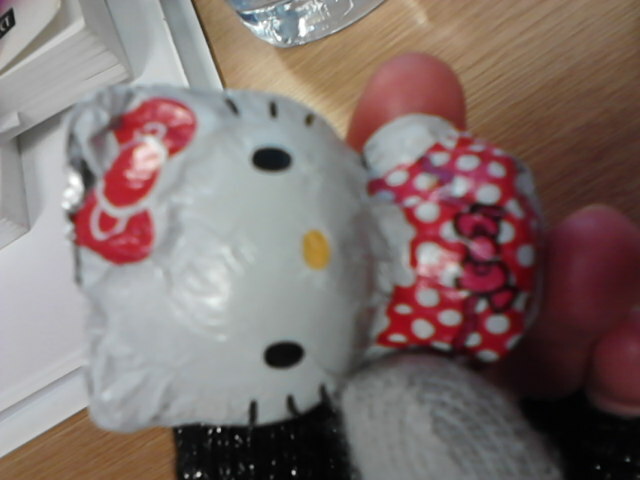 For the ‘side dishes’ I had Monster Munch 😀 pickled onion of course :), a chocolate Hello Kitty from Christmas, grapes and satsuma, with malt loaf (wrapped in foil). Have you eaten all you Christmas chocolate yet? I still have loads!